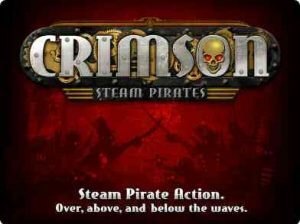 In Crimson: Steam Pirates, plumes of black smoke fill the blue Caribbean sky as Thomas Blood’s pirate fleet steams ahead—over, above, and below the waves. On the surface, ships bristle with swivel cannons and lightning guns. Above, zeppelins drip with incendiary bombs. And below, silent and deadly, submarines stalk their targets, torpedoes at the ready. Presented by Bungie Aerospace and conceived by the mind of Harebrained Schemes’ Jordan Weisman, creator of the MechWarrior, Crimson Skies, and Shadowrun universes.